Winds have been rather light these past few weeks. Things started changing and we actually got to fly a couple of extra times this week. I’ve decided to do something that I’ve never had the courage to do before. I am working on a performance routine for the upcoming kite festival. The first evening we went out I didn’t get much practice done at all. Instead I played with a little girl. I was flying the Vamp Devil and along came a family with a little girl. She loved the kite and I made it swoop and dive and dance near her. She giggled and giggled. Her family wanted to continue their stroll but she wouldn’t leave. She and her Dad ended up staying by me as I continued to entertain her and the rest of the family went walking. We had fun together until the sun began to go down. I didn’t get much practicing done but I had a great time, too. And that’s what kiting is all about. The second evening we went to the beach, I did get some great practice and planning in. I had the iPod on continuous repeat of the music. So I improvised and planned as the music went on and on and on. It was a good practice. I was flying on short lines to get used to the response of the kite and see what worked and what didn’t. Again, we stayed until the sun was going down. I really like flying in the evenings. The air is cool and the beach is quiet. There are some people out walking but not too many. Everything is peaceful. It’s just you and your kite. Then there was a very short morning fly. I was testing a new kite that I’ve been waiting to arrive for the past nine months. I had seen this kite in photos from the kite trade show in February. It intrigued me and I just had to have one. It is a new design that I just had this gut feeling it would be a good flying kite. The initial flight was really an eye-opener. It is fast and touchy. I had it on short lines and my inputs were really too strong and the kite was all over the sky. I have a lot of learning to do on this kite. But I like it. The winds that morning weren’t helping me at all. They were gusty, at times blowing strong and at others ceasing completely. I need to try again on longer lines in smoother winds. It may take me some time to fly this kite competently but I’m planning on continuing to work at it. And what kite am I talking about? 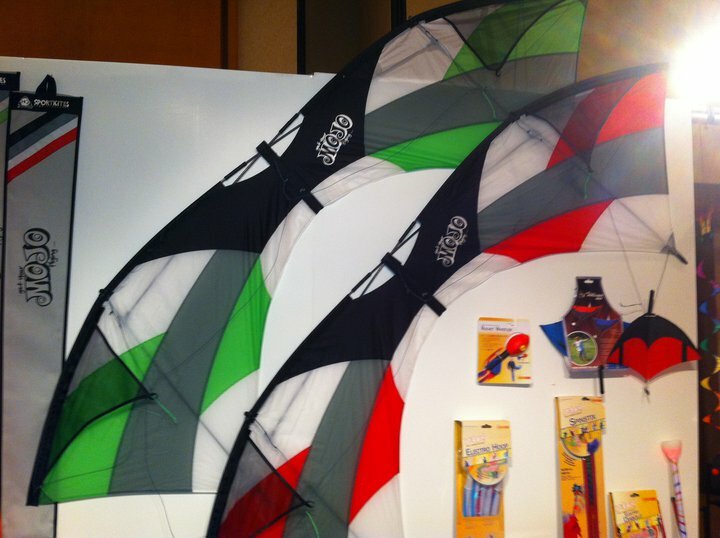 It is the Mojo by HQ Kites, a new design quad line kite. Sunday morning was our regular club fly. We had wind. We had a lot of wind. If you left your kite bag open when you flew, it was filled with sand when you got back to it. There were four of the kite club members in attendance and about eight kites in the air. The wind was so strong the selection of kites that were fly-able was limited. Larger deltas flew well and a Sutton with a trailing pennant banner stayed in the sky with no problem. I flew a large dragon kite. It should be noted that the kites in the air all had long tails to stabilize them. No small kites could handle it and no stunt kites were flown. This was a feast of wind after a wind famine. Things are coming together for the kite festival. Hopefully the temperatures will stay moderate and the winds will be a steady 10 to 15 mph. With an emphasis on steady. It’s only three weeks away. Can you believe it? I had better get practicing.